Sunday Simmer – Damn, I Can Make That! People say Sunday is the day of God, Rest, and Football. As you know I am a prolaxer (professional relaxer, for those of you slow on the uptake) So when it comes to a nice Sunday dinner, I am not one to slave over to stove for hours. I want something I can set & forget while I watch some NFL games and pray to God that my team wins! Here is an easy and yummy crock pot special that you can make any day of the week, mine just happened to be on a Sunday. Pinch of dried basil (if you do fresh, add it at the end and not to crock pot mixture). Cut your chicken breasts in half, sprinkle with salt and pepper and place in bottom of crock pot. Chop up your garlic cloves (or use 3 tbsp. of that jarred minced stuff we keep referencing) and add to the cup and half of liquids listed above (And my additions because I am an over achiever and act like I have an important cooking blog or something). Pour over chicken and cook on low for 6 hours or on high for 3 hours. 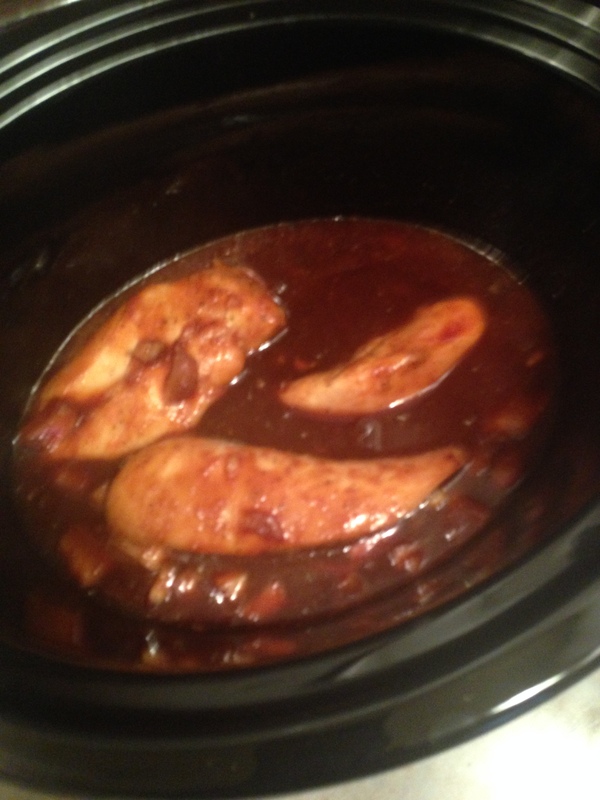 Remove chicken from the crock pot and transfer to covered plate to keep warm. Simmer or reduce the sauce in a pot until thickened to desired consistency. Serve sauce over chicken. Note, I made the jazzed up rice and steamed some broccoli to go with this and it was pretty yummy! This entry was posted in Damn Good Dinners and tagged chicken, garlic, honey, ketchup, rice, soy sauce. Bookmark the permalink.